I finished the apron quilt and have to say it was a really fun project. 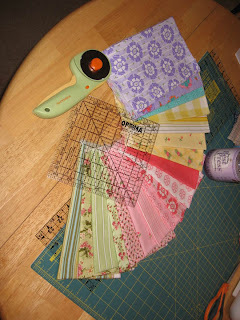 I loved working with these fabrics and the aprons were easy and fun to put together. Most of the fabric is from Michael Miller. I keep finding myself drawn to the yellow, red and green combination. They seem like such happy colors. I was originally going to finish the back with all green, but they ran out of the fabric and weren't going to be carrying it anymore so I did a little creative piecing and had fun with the back. 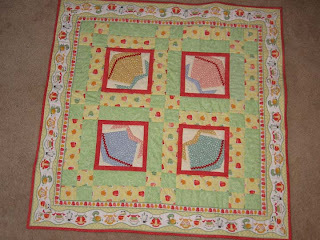 It is far from perfect, but then it is only my second quilt and matching up mitered corners on the front and the back was sure difficult. 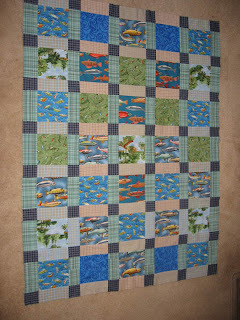 Now back to work on the fishing quilt. Hope I can report progress on that soon! Tomorrow is my fisherman's birthday! Happy Birthday, Michael! 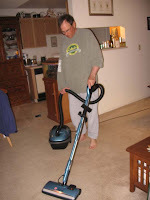 He is always a busy little housekeeper so I got him a new vacuum, now he can really clean up! What a lucky girl I am...not sure who the gift will benefit more...both of us I hope. Now we just need some better weather so he can get out of the house and go fishing then he will truly happy no matter how old he feels. 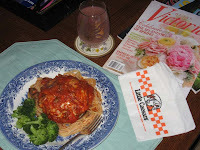 My little happy homemaker made me the most delicious veal parmesean for dinner the other night and we were laughing at how we were eating this beautiful dish on the coffee table with Little Caesar napkins and reading Victoria magazine. It somehow so represents our lifestyle at the moment. We are always trying to enjoy the finer things a little while we make do with what we have. I even pulled out my good glasses for this meal. The table is currently my sewing area so there has not been room to eat there. We also used the coffee table the next day as a potting table to transplant our tomato seedlings. We wrote about that in our other blog...Growing Thymes. When life gives you lemons make lemonade! Well, I did a little work on the fish themed quilt today and got the top all pieced now all I need is some batting and a little more time to get it done. It was a fun project and I am happy with the results. I did a lot of planning and trying different layouts then scrapping a few until I came up with a plan I liked. 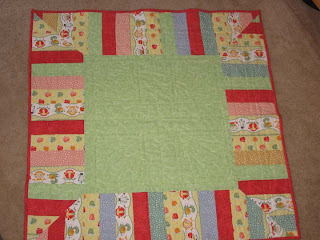 I had just about enough fabric though I had to do some creative piecing and a little substituting in the end. 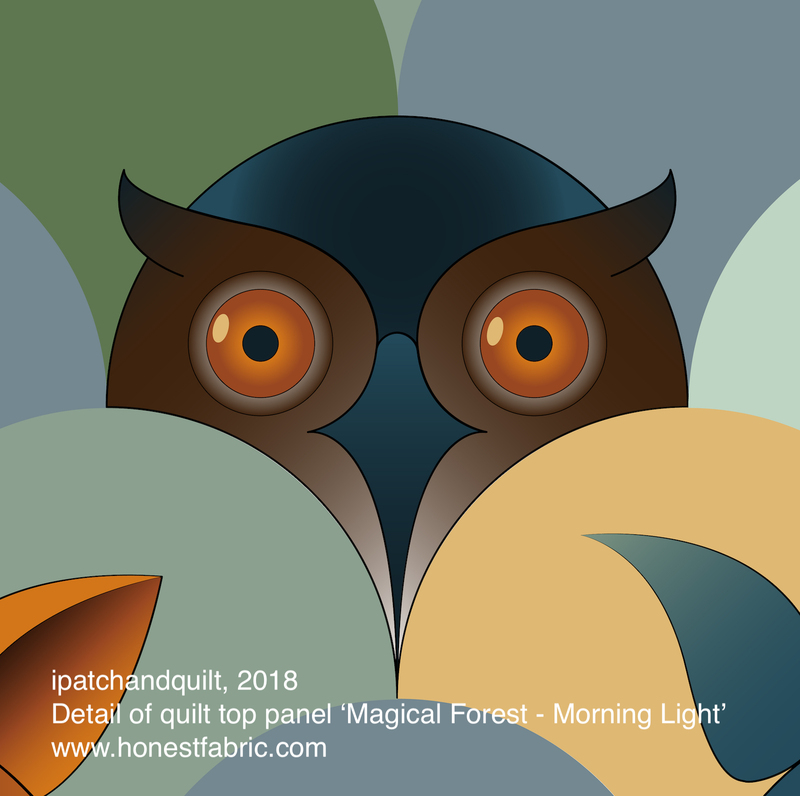 I made this to use as a lap quilt for me and my fisherman on those cold winter nights spent cuddling and watching TV. I have some flannel for the back so it shouldn't take too long to get this done. Now on to the next project in progress (though this one is not officially done yet). Working on this project was making me wish I had an EQ6 program. I am afraid I would get too involved with playing with it on the computer instead of working on projects, but it sure looks fun and I enjoyed the layout process of this project a lot. I'm sure this is not anything I really needed to do, but it did feel good none the less. I went to a birthday sale at a nearby quilt shop and they were selling fat quarters for 98 cents each so I couldn't help, but to add the stash. Now I feel like I have more fabric to paint with. Can't wait to see what I come up with. These colors are looking like Spring! 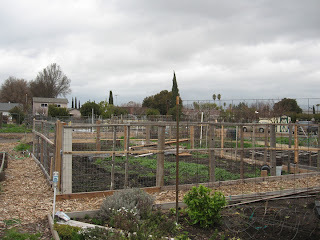 We had a meeting at my community garden a few weeks ago to discuss the look of the garden. Many of the occupants were putting up fences with padlocks to protect their gardens from theft. It was looking horrendous in my opinion, nothing like a community garden should look. 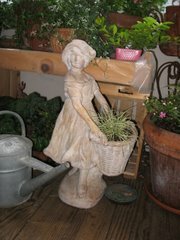 We all have a common goal...to garden and grow produce and flowers for our personal use and satisfaction. I really don't think there is any reason to be stealing from one another or to create barracades to keep each other out. It was voted by a majority ruling that the fences should come down and that we should all be watching out for each other and acting more like a community. I am pleased with the outcome and can't wait to see if we are successful at coming together and taking care of each other as a community should. Perhaps this will be a good lesson in awareness for us all. this picture is how the garden was looking at my last visit 2 weeks ago...let's hope that I have a much more pleasant picture to show in the weeks to come.